A new seed bed must be kept moist in order for the grass seed to germinate. This means watering 2-3 times daily. IF THE SEED BED IS ALLOWED TO DRY OUT JUST ONCE YOU CAN LOSE UP TO 30% OF YOUR SEED GERMINATION. What this means is if you are watering once a day with a garden hose it is not enough. 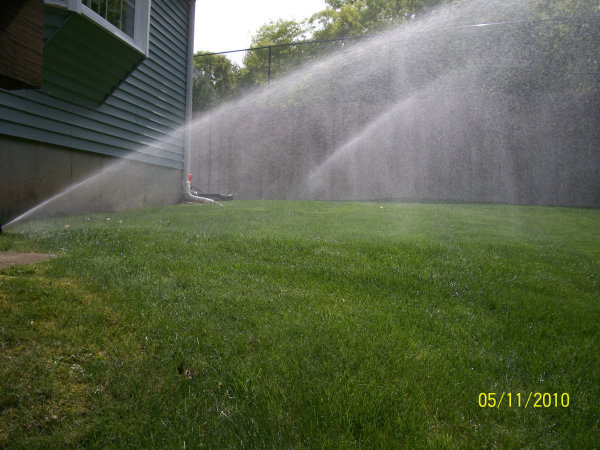 Water is the key element in the success or failure of your new lawn. Water new seed bed 2-3 times a day to keep soil moist. Once grass seed has germinated DO NOT STOP WATERING. Now the seed is a young seedling with a growing leaf area to support with a very small root system to draw water with. Now that your grass seed has germinated and is about 2″ tall you should increase the watering time to a minimum of 30 minutes 3-4 times per week. This will cause the root system to grow down in search of water rather that up towards the surface where the moisture is after light watering. The best time of day to water your lawn is the morning. This will provide moisture for the grass plants well into the day when they are under the most stress from the midday temperatures and drying sun. Also evening watering creates extremely high nightime humidity and optimum conditions for many fungus diseases. NOTE: Here are some general germination times for different grass seed species. These are under optimum conditions and are affected by temperature and moisture. These are to give you an idea of the amount of time before you see any germination. Many people will get discouraged and stop watering before the seed has had enough time to germinate.